for the pan and fender i started with a buttboard from Tim. I cut a section off of the front that I later flipped upside down and mounted on top of the front boom over the front wheels for use as a fender. 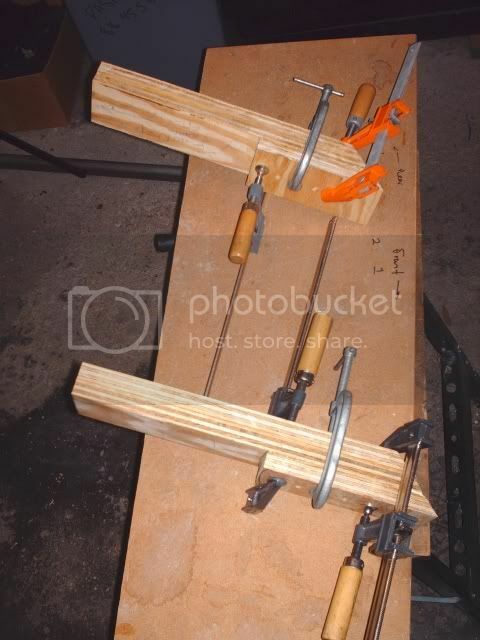 the booms were the parts that bowed/twisted over time, so i made my own 2 x 4s out of stacking 2 layers of 3/4" plywood, then another layer of 3/4" ply for the spacer, then glued them together, and left them clamped for about a year. the connectiong between boom, pan, and rail on this desing uses two large bolts that are recessed into both the bottom and the top of the connection. this is done on both the front and back. 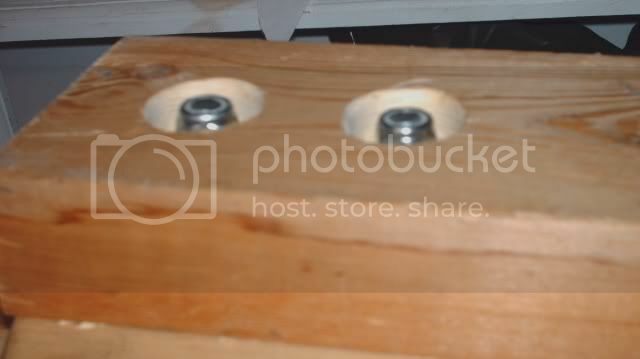 these use locknuts and washers but are not permanently fastened. Ive had this slep up to speed just once and after tweeking the trucks it rode like a dream. 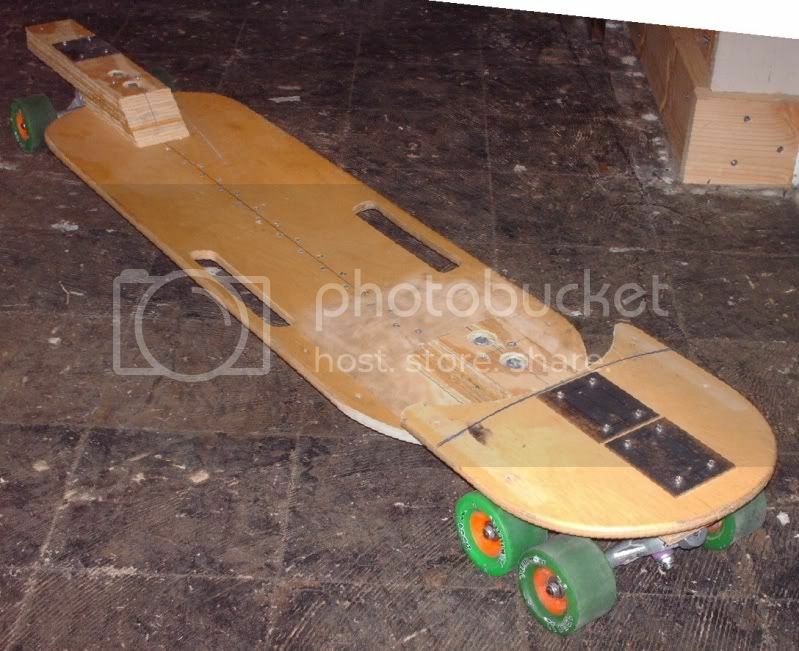 i sitll have to fabricate handles, do all of the finish sanding, disassemble and paint it, but i am confident that this will gimme years of fun. 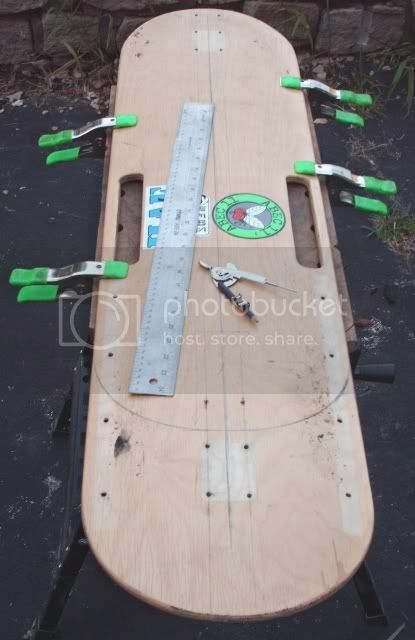 i hope the idea of using a buttboard like this comes in handy for guys wanting to build solid sleds on a budget. That's a very slick wood design. 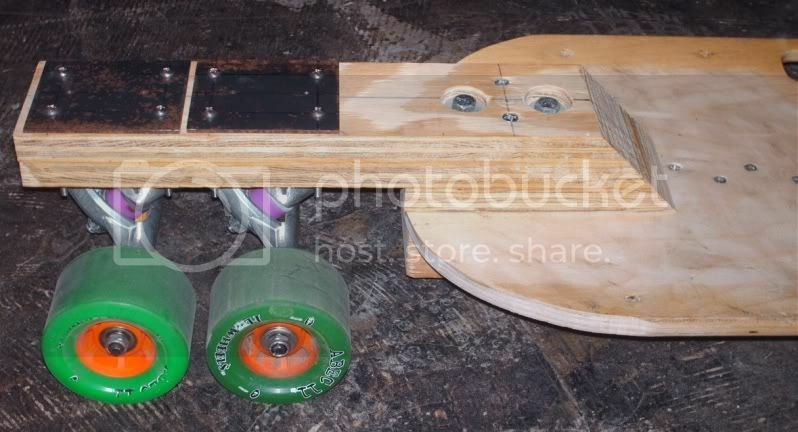 I like the idea of using Tim's buttboard as the pan and the plywood booms. But you left them clamped for a year?!?!? they stayed clamped for a year, not as part of the desing .. just cuz after i clamped 'em i didnt back to 'em for a while! That is an interesting idea. Looking forward to seeing the finish product. By the way, if anyone else wants to try this... 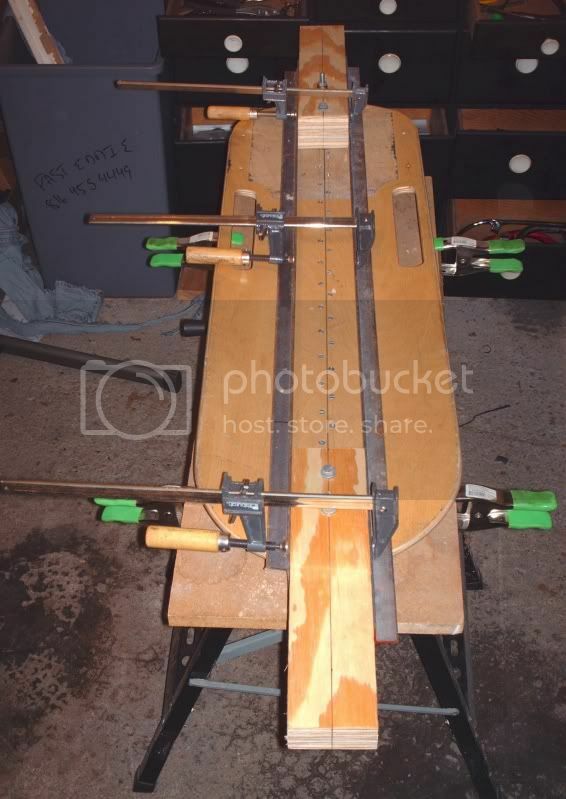 It might be cheaper to by the concave wood from the lumber yard (might need to go to a specialist) I believe you can by the wood in 2 or 4 foot wide strips, so it might be difficult to cut the concave length wise. But it might be cheaper than purchasing a prebuilt board. I had blemished buttboard decks I repurposed over the years. Very heavy but fun to ride. I would use solid maple 1 by 4 for the front and back joints. put a 45 in them, stack it and glue and clamp them. you can keep doing that until you get your deck low enough. mine are either 2.75 inches of 2 incheds off the ground. That method has worked well for me. 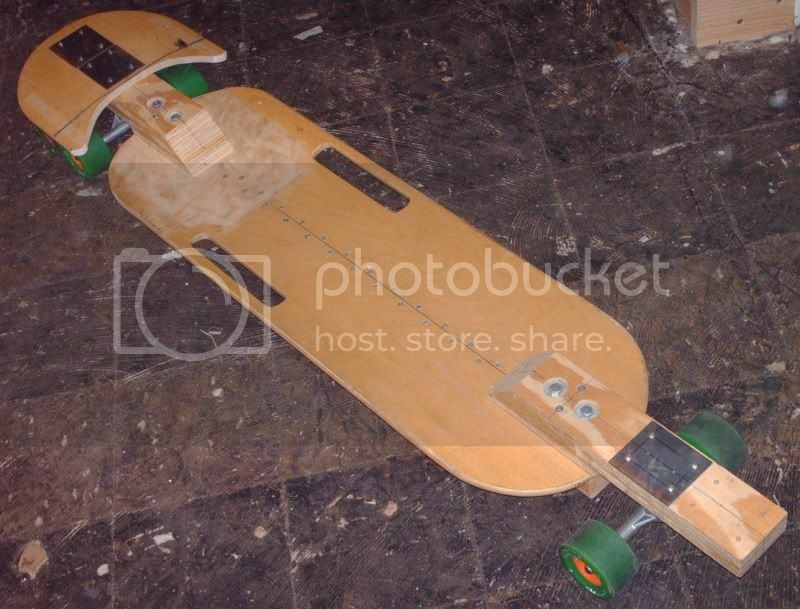 my wood boards arent that light usuall around 15 to 20 pounds but they dont felx much at all. 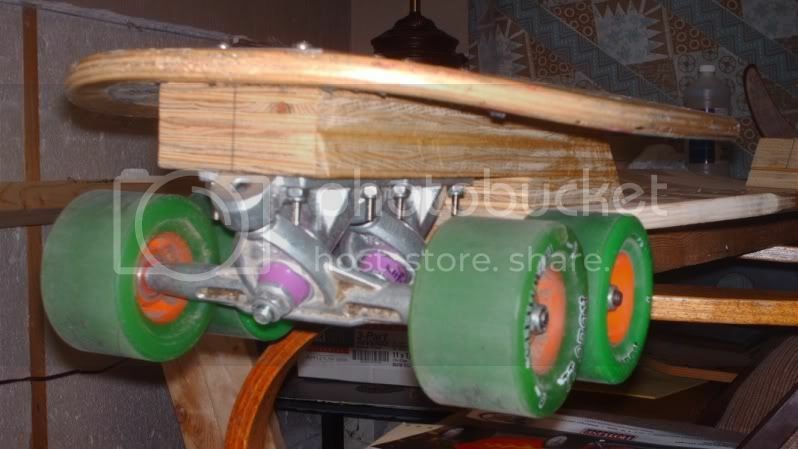 Im starting to favor just bending the drop in the board and not having to bolt anything on for the wheels now though. more elegant that way.